Our driftwood playground is finally complete…for now. The latest addition is a child-friendly ‘bridge/ladder’ over a roofing iron fence from the pigpen to the playground. How appropriate! Talk about a design challenge: making an overpass that is kid-friendly but pig-proof. All of the playground equipment is made from New Zealand native hardwood. The swing set is held together with galvanised threaded rod. It is a good example of chainsaw joinery. The wood is rock hard. I dulled the chainsaw blade in 15 minutes. The swing will easily last for decades. 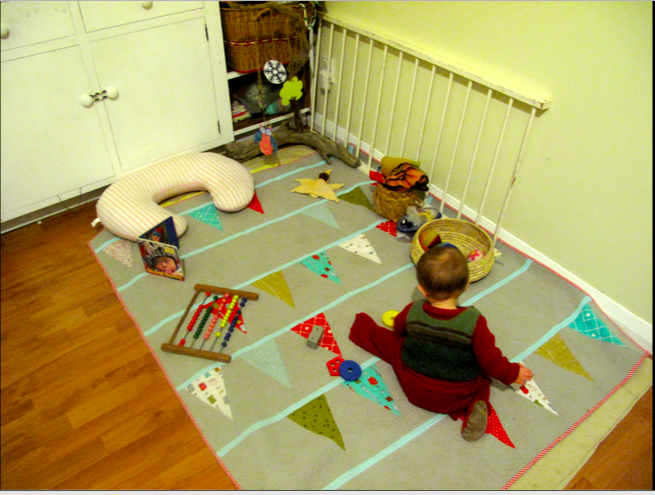 This is one of the first projects we made for EcoThrifty Baby. We wanted a play gym for her, but were (and still are) trying to avoid plastic as much as possible. Ironic, since tupperware is her ultimate favorite toy at the moment. ETB chillaxin on her sheep skin under her handcrafted playgym – lifestyles of the rich and famous. I made the hanging pieces for this playgym from scrapbook paper glued onto cardboard. I tried to pick natural themes and shapes, but also wanted her to have high contrast and bright colors for her little developing eyes. The pieces of ETB’s play gym were scrap book paper glued onto thin cardboard. ETH scoured the beach near our house for a few days before he found the perfect pieces of driftwood to form the base and hanging frame. He then drilled a hole into the base just slightly smaller than the diameter of the piece that he wanted to use for the frame, and sanded it down to make a perfect fit. The base is heavy enough that ETB can’t pull it over if she tugs on the shapes. Driftwood frame with no glue, no nails. When ETB was a tiny infant we hung the shapes over her carseat and bassinet. When she transitioned into her bouncy chair, they were her favorite entertainment. Now that she is a crawler, this still sits in the corner of her play area. Every once in a while she still bats around the shapes, but I think her days of really enjoying the play gym might be over (sniff, sniff). ETB as a tiny bub with her play gym pieces hanging above her. ETB is a big girl now and her play gym still sits in the corner of her play space.